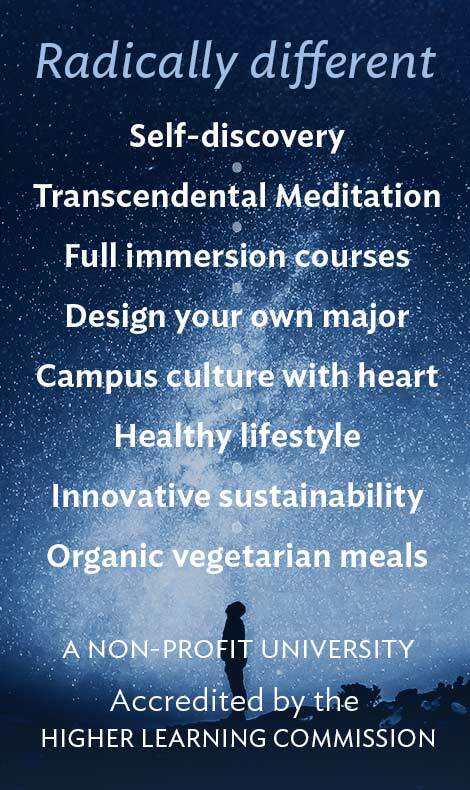 The Science and Technology of Consciousness (STC) is a basic course in Consciousness-Basedsm education that is the unique educational approach of Maharishi University of Management. 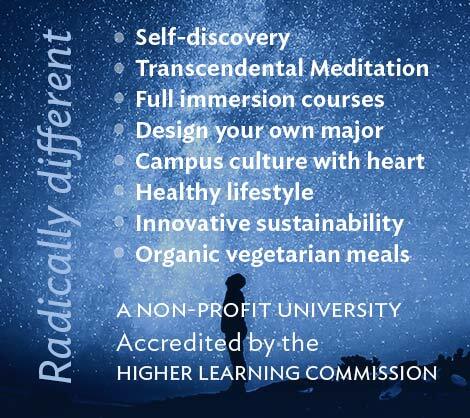 Our university was inspired by the teachings of Maharishi Mahesh Yogi, a scientist and Vedic scholar from India. The practical aspect of STC is the Transcendental Meditation technique, a simple non-religious mental technique that produces positive effects on mental health, physical health, and social behaviors. For more information, go to tm.org.The goal of this course is for you to gain experience and understanding of consciousness as the unifying basis of all branches of knowledge. This course provides a foundation for all other courses you will take at Maharishi University of Management and introduces you to key ideas and terms relevant to your studies and to your experience here. This course demonstrates how the historical development of unified quantum field theory has been intimately concerned with resolving the apparent opposition between observer and observed. In this context, the student can readily understand how Maharishi Vedic Science completes and enriches the most sophisticated discoveries of advanced physics. The goal of the course is to gain a deeper understanding of higher states of consciousness as described in Maharishi Vedic Science, and a more profound appreciation for how they can be cultivated through Maharishi’s technologies of consciousness. A primary objective of this course will be to accelerate the development of consciousness through an ideal daily routine and through daily practice of Maharishi’s Transcendental Meditation program. In this course, students discover the fabrics of immortality in their own physiology. Topics include the self-interacting dynamics of consciousness, the Constitution of the Universe, the forty aspects of the Veda and Vedic Literature, Maharishi’s Apaurusheya Bhashya, Rik Veda, and Vedic Devata in the human physiology. This course will examine the methodology of creating a permanent state of world peace. Topics will include: the structure and function of the total potential of Natural Law — the Government of Nature; the significance of Collective Consciousness and its effect on government; the Global Country of World Peace; and, scientific research on Vedic technologies that align individual and national awareness with the infinite intelligence and creative power of Nature’s Government, which administers the universe with perfect order. In this course, students review their growth and understanding of higher states of consciousness by writing two papers: a personal narrative of their experience during their course of study in the MA program, and an academic paper reviewing the main principles of Maharishi Vedic Science they have learned in their coursework. In addition, students view tapes of Maharishi on education and give written and oral feedback on their educational experience in the MA program. Learning activities — chat room (text based) to discuss points and to comment on other students’ points. Students will be asked to enter some response each week to pass the class. Webinar (video based through Adobe Connect) to discuss larger issues. Students will be asked to participate or view the archived copy each week to pass the class. This could be done at a local centers. Please email the Distance Education department at de@mum.edu, use the Contact Us button on this page, or call Admissions reception at 800-369-6480.